Aqueduct Park is a rather barren park about 5 miles southeast of Rome's center where 3 aqueducts can be easily seen. The park is only about 5 blocks walk from a metro stop, so is easy to get to. Take the metro Line A (red) south toward Anagnina, and get off at Subaugusta, 2 stops from the end of the line. Exit the metro station to Viale Tito Labieno, which is the smaller street of the two that cross where the station is located, the other being Via Tuscolana. Walk down Viale Tito Labieno until it ends, after four rather long blocks. Turn left onto the street it ends at, Via Lemonia, and walk one more block until that street takes a sharp turn to the left. At that point, enter the park, on the right side of Via Lemonia. You'll immediately see a newer (1500s) smaller aqueduct (Aqua Felice) heading off toward the right, and the main object of our trip, the Aqua Claudia beyond it, stretching off into the distance to the left, with shorter broken segments going off to the right. Don't expect a park with amenities like water or very much shade; this park is at the edge of farmland and offers only dirt walking paths beside the up-close views of the Aqua Claudia and Aqua Felice. 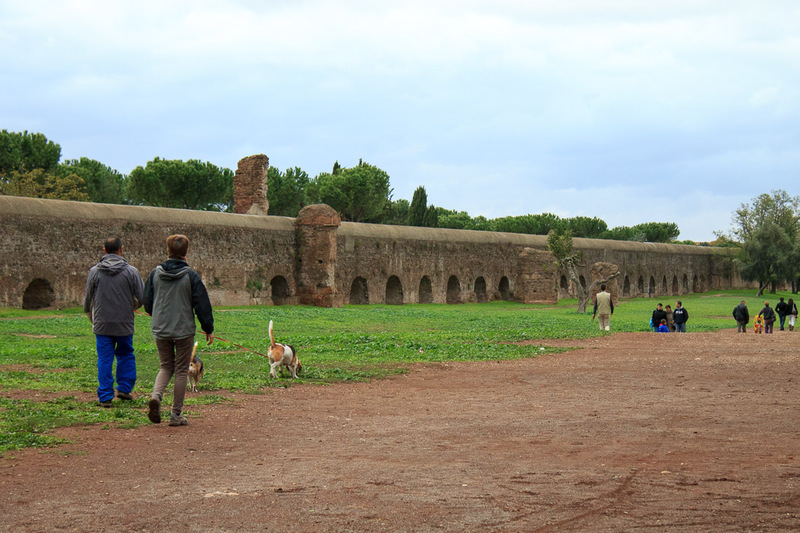 You can walk up to the aqueducts and touch them, stand under their arches, and get a great view of how they stretched on for miles, and how they've partially crumbled over the eons. The best and most famous of the aqueducts visible here is the Aqua Claudia (both photos below) which ran on the top of the magnificent ancient arches in the park. These arches, stretching on for quite a distance, are the highlight of the park. 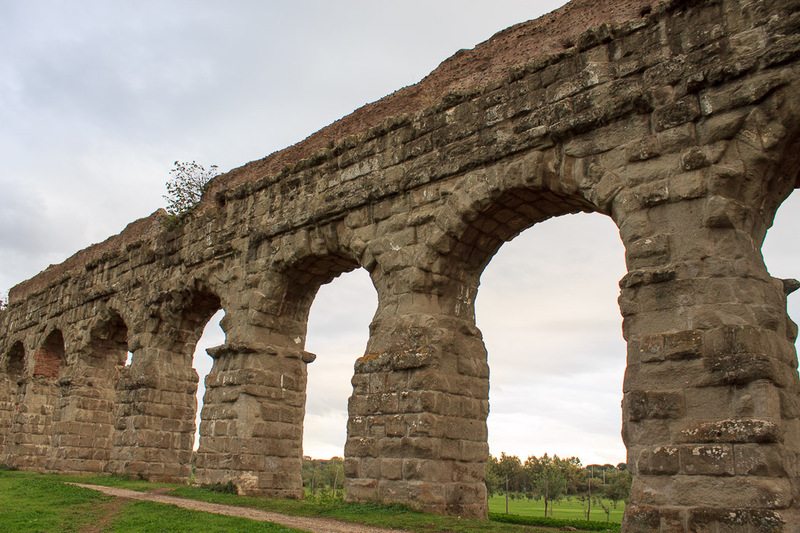 Just imagine the engineering skill required to make the aqueduct's channel at the top of these arches fall by 1 foot per 300 feet of travel so gravity would pull the water into Rome. The aqueduct travelled for about 38 miles, mostly underground, from its source until it reached this point, then it travelled another 7 miles on arches into the city. The second aqueduct visible here borders on cheating. It was the Anio Novus, whose channel was built on top of the channel for the Aqua Claudia on these same arches. The source of that aqueduct was about 50 miles away, further than the Aqua Claudia. See all Aqueduct Park photos. The third aqueduct visible in Aqueduct Park is the Aqua Felice (1st photo below) built in the 1500s therefore not ancient. There are also technically 4 more aqueducts in the park, making 7 in total. The Aqua Mariana, Aqua Julia and Aqua Tepula ran inside a ditch which you'll only find if you know where to look (I don't), and even then, it's only a ditch. The Aqua Marcia shows as crumbled traces here and there.